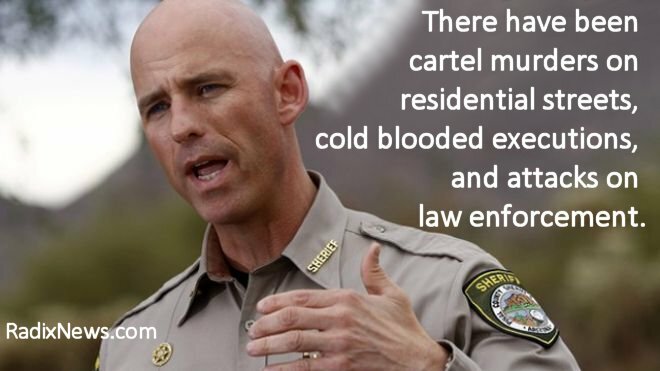 President Obama is making the lives of citizens worse, not better, along Arizona’s border with Mexico, Pinal County Sheriff Paul Babeu said Tuesday. Sheriff Babeu is not the only lawman to complain about the Obama Administration’s handling of border security and overall crimefighting. He’s joined by Milwaukee’s Sheriff David Clarke (see video below) and the membership of the U.S. Border Patrol’s union. President Barack Obama isn’t the only officials to raise the ire of the nation’s law enforcement commanders and officers. Recently, Democratic Party presidential wannabe Hillary Clinton was slammed by the National Sheriffs Association and the 100,000-member Fraternal Order of Police for her statements accusing cops of being racist and trigger-happy. Clinton is known for her pandering for votes using the military, law enforcement and the intelligence community as cannon fodder for her pandering. “He [Obama] has manipulated the data, had agents assigned to low traffic areas and attempted to quiet dissent by calling those who question his approach as misinformed without offering any evidence to support these allegations,” Babeu stated. Babeu said 1,500 Border Patrol agents that are mandated by Congress “are not being hired and we see… another 300 Border Patrol agents that are being cut. That’s approaching almost 10 percent of our Border Patrol that is not being added to guard and defend America.” Babeu said rising terrorism threats make this a dangerous time to leave the border poorly guarded. Sheriff Paul Babeu is America’s 2011 “Sheriff of the Year,” as selected by his colleagues in the National Sheriffs Association. He proudly leads a department of 700 full time employees. He won his first term in 2008, in a landslide victory over the incumbent. In so doing, he became the first Republican elected in the history of Pinal County (founded in 1875). Pinal County is the number one pass through county in all of America for drug and human smuggling, ground zero in the fallout over America’s unsecured southern border. Pinal County contains an estimated 75 – 100 drug cartel cells and listening posts/observation posts, used to facilitate the illegal transportation of people and narcotics into the United States. There have been cartel murders on residential streets, cold blooded executions, and attacks on law enforcement. “What we see from this administration is an actual reduction at a time we should be providing more support to secure our border,” Babeu said, noting that illegal immigration is up 25 percent in the first four months of fiscal 2016. National Border Patrol Labor Council President Brandon Judd joined Babeu’s complaint on Tuesday. “We are either going to be a specialized law enforcement agency dedicated to enforcing our nation’s immigration laws or a political arm of the administration,” Judd said. “The president is bypassing Congress by legislating through policy. These policies in essence are granting amnesty to thousands, if not millions, of persons who enter the country illegally,” Judd added.